If you have several related grid sets, it makes sense to link them as an integrated study unit. This can be moved as a unit, so it is easy to share. 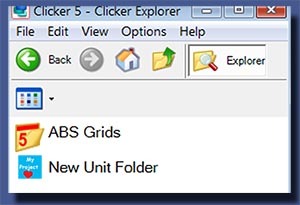 It can be copied into the Clicker 5 Shared files folder, so that it appears in Clicker Explorer. Optionally, you can add a custom icon so that the study unit stands out among the files a student sees in Clicker Explorer. It can have a menu grid with links to all the activities of the unit, and instructions telling the student which to open first. These links will hold IF, and only if, the unit folder is always duplicated or moved as a unit. Download and then expand the zip file of the unit. Then it must be moved or copied and pasted into the Clicker 5 Shared files folder.Do this from the desktop. C:\Documents and Settings\All Users\Documents\Clicker 5. Once you have located the Clicker 5 Shared files folder, drag the study unit folder into it. Or copy the study unit folder and paste it into the Clicker 5 Shared files folder. IMPORTANT: Do not make a new subfolder and move the contents of the study unit into it, or the links will break. Download the PDF file below for detailed instructions on installing an integrated study unit like the Clicker 5 downloads for Inventions and The Animals Game. This PDF will also explain how to create an integrated study unit, link the activity grid sets to a menu grid, and even create a custom icon to give your project a professional look and make it easy for students to find in and launch from Clicker Explorer. The menu grid for one of these units is fairly easy to design, but my goal is always to save you time! So I’ve also posted a zip file with a menu grid template in it. It has three cells to use as buttons linking to activities, and you could easily copy and paste them for more buttons, resizing if needed. Note that there is also a master grid in this file which you could use as a title page in any of your activities. You’d need to open this template, and the grid set you are building, at the same time. (Launch Clicker 5 twice, and open one in each). Then drag the title master grid into your activity. It has a custom button already linking back to the menu grid, so if you use this master to create the title pages of your activities, the links back will be set already! ClickerStudyUnit.pdf (971.9 KB) Detailed tutorial on installing and creating integrated study units in Clicker 5. Acrobat Reader. Clicker Study Unit Online Tutorial (971.9 KB) Online version of a detailed tutorial on installing and creating integrated study units in Clicker 5, ready to present to a group. UnitMenuABS.zip (246.9 KB) Template for a menu grid in Clicker 5. Has a master grid with custom link button.